HBTU is coupling reagent for peptide synthesis. 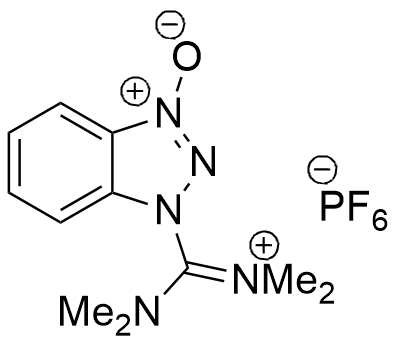 Recent studies show that crystal as well as solution structure of this coupling agent is a guanidinium N-oxide and not an uronium compound. HBTU is attributed to various advantages, such as -very low racemization, simple reaction conditions, very short reaction time, and high yields. S. M. Mali, M. G. Kumar, M. M. Katariya and H. N. Gopi Org. Biomol. Chem., 2014, 12, 8462-8472. I. Abdelmoty, F. Albericio b, L. A. Carpino, B. M. Foxman, and S. A. Kates Letters in Peptide Science, 1994, 1, 57-67. A. El-Faham and F. Albericio. Chem. Rev., 2011, 111, 6557-6602.